Ni-Asp-bipy is a mixed linker MOF (metal organic framework) with the chemical formula [Ni2(L-asp)2(bipy)]. It is made up of octahedrally coordinated nickel and and linkers. Each nickel cation binds to three aspartate anions - one binds in a tridentate mode, and the other two in a monodentate mode. 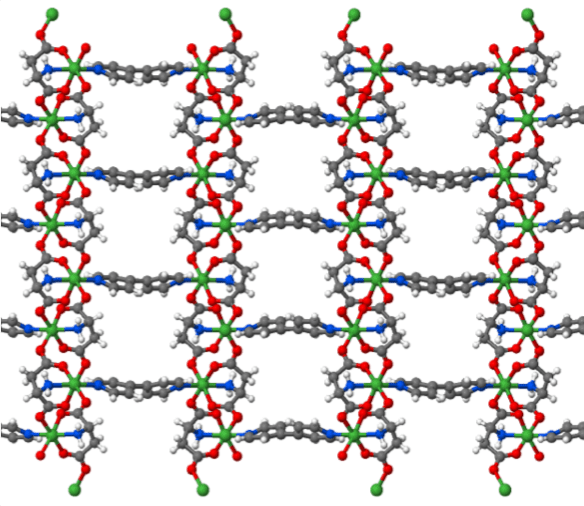 This MOF is made with methanol and water molecules in it, but it retains its open framework structure upon loss of the guest molecules. It has a chiral internal surface, due to the chiral aspartic acid linker, and has been shown to have enantioselective sorption properties.